March 29, 1974 marked the first day that the Volkswagen Golf rolled down the production line in VW's adopted home town of Wolfsburg, in Germany. Since then, VW reckons it's sold a Golf every 41 seconds around the world, with the line-up set to expand to its most technologically advanced version ever next year in the form of the Golf VIII. It's not all been sunshine and roses for the world's second most popular car; no one really liked the Mk III all that much, and VW's most famous model was swept up in the Dieselgate scandal of a few years back. 1 The VW Golf debuted in 1974, after a period where the company – which had grown dependant on the Beetle – was in a slump at home and in the US. 2 The Mk 1 was penned by renowned Italian designer Giorgetto Giugiaro, who also worked for Maserati and BMW, amongst many others. 3 The Mk1 was sold between 1974 and 1983, notching up around 3 million sales during its tenure. 4 It was the first VW product to use a front transverse engine layout and front-wheel-drive, and it introduced engine water cooling – and by dint, the first heater! – to a VW product. 5 The MkI GTI debuted with a 1.6-litre fuel-injected, watercooled four-cylinder engine making around 81kW. 6 As part of a publicity stunt, a Mk1 crossed the entire American continent from Alaska to Tierra del Fuego, a distance of 30,514km, in 94 days. 7 The Golf is the second best-selling car of all time, with around 35,000,000 sold to the end of 2016. The best seller? The Toyota Corolla, with more than 45,000,000. 8 Golf is German for Gulf, and was so named to keep it in the ‘trade winds’ car naming theme of the Scirocco, Passat and Bora. 10 The original tyre selected for the first GTI in 1976 was actually bigger than the standard rubber of the 911 of the day. The Golf was supposed to run 205/60 tyres, at a time when Porsche fitted 185/70s to the 911. 11 The Golf is directly related to more than 20 other cars, thanks to the use of the modular MQB chassis. From Audi to Spanish brand SEAT, multiple vehicles use the same MQB platform. 12 In 1974, Volkswagen started selling the Golf in the US, calling it the Rabbit; the Golf name was thought to be too aspirational. VW brought the Rabbit name back to a Golf GTI limited edition in September 2018. 13 The Golf MkII sold between 1983 and 1991, and notched up more than seven million sales worldwide. 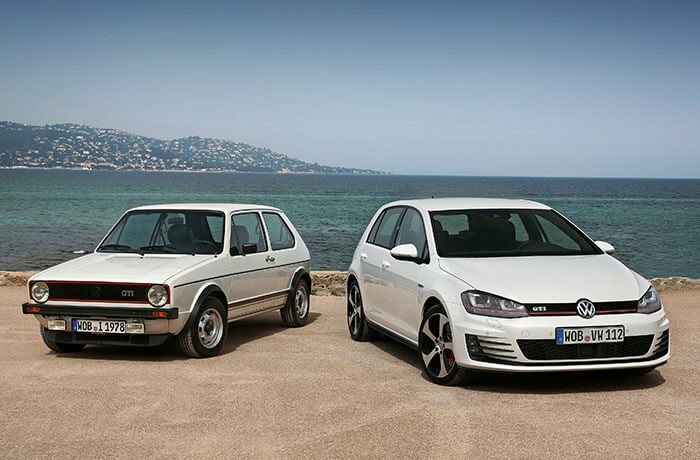 14 Volkswagen launched not one, but two Golf GTI Pirelli Editions; one in 1983 and the most recent in 2009, both in Pirelli-inspired yellow paint. The early version used Pirelli-made rims, while the later version used special $400-a-corner Pirelli tyres. 15 The Mk II was the first Golf to score tech like a catalytic converter and anti-lock brakes. 16 Bugatti’s W12 was dunked in a limited edition Golf (actually it was a Phaeton engine, but whatever). 17 The Golf overtook the Beetle in 2002 for title of world’s most popular car. 18 In 1988, VW sold 10m Golfs worldwide. 19 The MkIII sold between 1991 and 1997. It introduced tech like front airbags to the model for the first time. 20 VW also introduced the first-ever Golf wagon- or ‘estate’ in the UK - with the MkIII. 22 VW builds and sells 2000 Golfs a day around the world. 23 The driverless GTI 53+1 was developed in 2006 for dynamic research and testing. The computer-controlled 147kw GTI had grille-mounted radar and laser sensors and was named in honour of an earlier VW that could drive itself; Herbie the Love Bug wore number 53. 24 The millionth Golf was delivered in 730 days after its debut in 1974. 25 The six-cylinder Golf was introduced with the MkIII in 1995, and it continued through to the MkVI before making way for a 2.0-litre four-cylinder turbo. 26 The Golf is built in five countries, including Germany, Brazil, China and Mexico, and exported to 155 markets. 27 There will be no pure electric Golf; instead, the ID will fulfil the role of VW’s electric hatchback. 28 The diesel Golf first appeared in the Mk1 in 1980, while the TDI, short for Turbo Direct Injection, debuted in 1993. 29 At one time, the Golf was the only car in the world to offer electric, hybrid, diesel, petrol and LP gas powertrains, as well as front and all-wheel-drive. 30 A Golf special model was named after American rock band Bon Jovi in 1996 to coincide with the launch of the MkIV model in Europe The Golf Bon Jovi offered a better stereo and sports seats. 31 The MkIV sold between 1997 and 2003, and heralded the introduction of the first all-wheel-drive Golf. 32 It came in three-door, five-door, five-door wagon and three-door hatch guises. 33 The MkIV also introduced curtain airbags in 2002. 34 The MkV sold between 2003 and 2008, and heralded the return of the three-door GTI to Australia. 35 The wait for a new MkV Golf GTI in Australia stretched out to more than a year at one stage, and forced VW to import the five-door version to satisfy demand. 36 The MkV also saw the introduction of rear multi-link suspension, as well as a seven-speed dual-clutch gearbox. 37 The engine in the Golf R, though sharing the same EA888 engine code, features a stronger cylinder head, hollow exhaust valves and a bigger radiator. 38 The tartan pattern on Golf GTI seats is called Clark Plaid and was introduced by VW’s first female interior designer, Gunhild Liljequist, who joined the company in 1964. Ms Liljequist also conceptualised the dimpled gear knob, which was reportedly ridiculed at the time. 39 The R was not the first 4WD Golf with a GTI engine, though. The 1989 Rallye Golf was a 5000-unit limited edition variant with a supercharged G60 four-cylinder engine with synchro 4WD. It was based on the Golf MK2 but came fitted with square headlamps, colour coded bumpers and semi-angular extended wheel arches. 40 Clark Plaid was re-introduced into the Golf GTI lineup from MkV onwards but was inexplicably renamed ‘Jacki’ for the 2016 MkVII Golf GTI. 41 The inside surface of the Golf MkV was supplied unpainted, to save on manufacturing costs. 42 The initials GTI possibly stand for Grand Turismo Iniezione (Grand Tourer Injection) but no one is 100 percent sure how or why the three letters were chosen. 43 The MkVI sold between 2008 and 2012 and was hailed as a manufacturing triumph for VW, whose cost-per-unit on the previous car was way above the industry average. However, the MkVI’s twin exhausts were, according to company sources, an expensive indulgence insisted upon by then-VW chief Martin Winterkorn. 44 The MkVII debuted in 2012, and the 7.5 was unveiled in 2017. The MkVIII, meanwhile, is expected to go on sale in Australia in 2020. 45 The 19-inch Ruby rims on the Aussie spec Golf GTI 40 Years were voted for by Australian GTI owners and enthusiasts via an online poll.